Happy Fountain Pen Day! 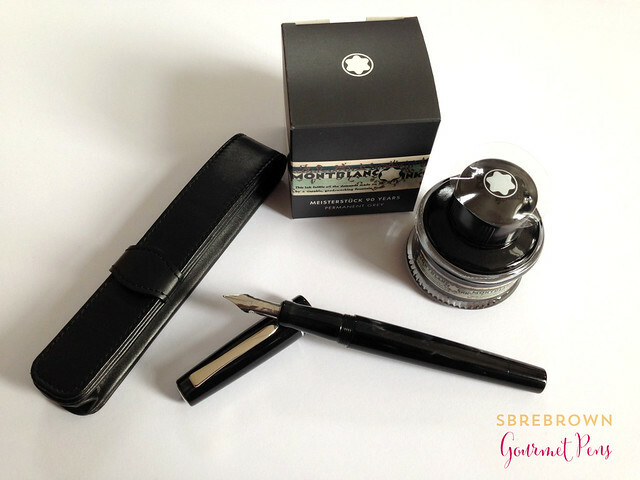 To celebrate, SBRE Brown and I are giving away a Marlen Aleph steel flex nib fountain pen, a bottle of Montblanc Meisterück 90th Anniversary Permanent Grey Ink, a single pen case, and some Fountain Pen Day swag! (Not all that is pictured, but some!) Enter the giveaway below the images! Check out SBRE Brown's awesome Fountain Pen Day video as well! 1. No creating fake accounts for bonus entries - these will be disqualified. All entries will be checked for validity. 2. Giveaway is open from Friday, November 7, 2014 to Friday, November 14, 2014 at midnight Eastern. 3. GIVEAWAY IS OPEN WORLDWIDE SO GET YOUR REAR IN GEAR AND ENTER! This is really generous of you both! Thanks for a more than generous giveaway. You two are awesome (Gourmet Pens is more awesome though). I have had my eye on this pen for quite some time now. Very generous for you to give us the chance to win some a lovely pen. I intend to spend FP day giving my Conway Stewart pens (which I recently won) some TLC, then I'm going to write my gran a letter using my (much loved) Waterman 12 1/2 sharp italic (flexy). I'm here in Ohio celebrating Fountain Pen Day at the Ohio Pen Show: buying pens, ink, paper, and hopefully getting a specialty nib grind from the infamous Richard Binder. I want this. Great giveaway, and always nice reviews from you two! Happy Fountain Pen Day everyone! It's nearly the end of FPD here - you'll never catch up! Woo hoo! Tremendous stuff there, thank you! Wow that pen looks wonderful, flex nibs are the coolest. This is my first fountain pen day, I got my first pen a little over a month ago. I plan on celebrating by buying a second pen and some ink that's a little prettier than my blue-black Skrip! Happy Fountain Pen Day! I'm hopefully going to celebrate by ordering something awesome. I will be working all day, but I plan to take my fountain pens with me and write a few letters, and maybe do a little journaling if I have time. Happy fountain pen day! I'm hoping to order some inks today. Gorgeous prices ! Happy Fountain pen day ! That Marlen Aleph looks like a great pen! Thank you for the opportunity!! Happy fountain pen day! Thanks for the giveaway. I will celebrate by using fountain pens to take notes in class and maybe writing a few letters. Only using fountain pens for the day! I'm starting the morning catching up with all my pen blogs. This was a fun surprise! Thanks for sharing. The terrible thing about fountain pens is that you can decide not to buy any new pens... but there's always the temptation of new inks! trying out Herbin orange indien today. Sadly, Fountain Pen Day is already over here in Australia - and I was a bit too busy to celebrate it! At least I got to use a few of my pens, though - and enter a couple of Fountain Pen Day competitions! 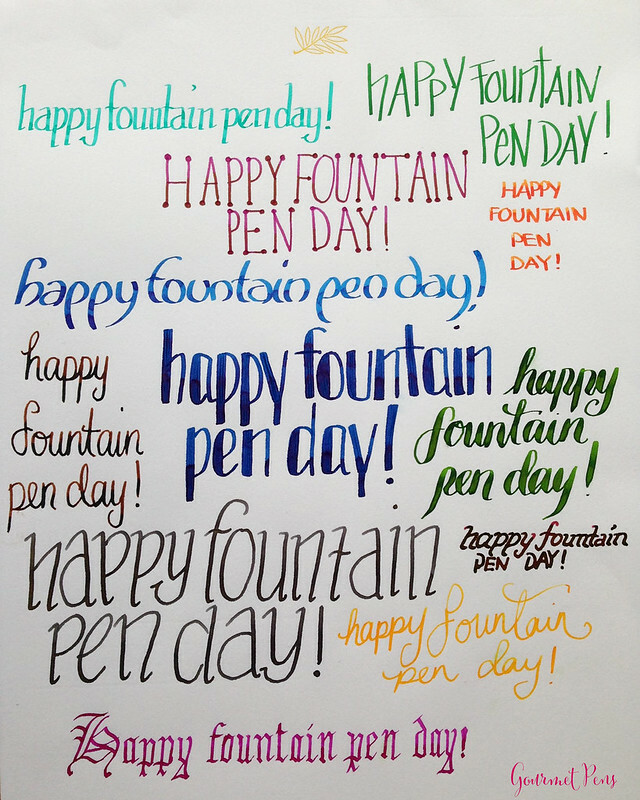 As a fountain pen fan, I'm so glad to find out that there is, in fact, a fountain pen day. I work at a rehab for teenagers. The kids find my fountain pens odd but amazing, because they are always asking about them. I plan on celebrating Fountain Pen Day by filling my pockets with cheap fountain pens from my very modest collection and letting the kids try them out. Nice to see giveaways and celebration all over the Internet! I'll be inking up a Delta Shadow and writing to my family. I already sent out letters to friends and plan on drawing up a couple of things before work. Sharing is also a must...busy day. Great Giveaway. I am writing a few letters that i am behind on and checking out a few new pens i might have to add to my collection. Happy Fountain Pen Day! Thank you both very much for this giveaway. Happy fountain pen day!! I'm celebrating by indulging in a new ink purchase and playing with my pens! Thanks for the chance to win. Happy fountain pen day! Thanks for the giveaway! I had ink arrive yesterday just so I could play with it today when I have to sign a bunch of official stuff. I hope they don't mind fun colors! Nice giveaway! Happy Fountain Pen Day! I'm cracking open two new bottles of ink: Rohrer & Klingner Morinda and Organics Studio Boron. I'll write letters to my Dad and to a FP pen pal. Writing, of course! Happy FPD! Wow, what a great setup! Happy Fountain Pen Day. Thank you. Such a generous giveaway. Thank you very much for the offer! I would love to try some of these out! Thank you for the chance! Lovely lovelies! I only just realized it was Fountain Pen day; I will take out my postcards and hand write them all in fountain pen ink and mail them today in honor. Happy Fountain Pen Day! I already sent pictures of some of my new and favorite fountain pens and ink to two of my friends this morning. I am definitely a promoter of the almighty fountain pen to my friends. This morning I spent writing with my new Stipula Splash. I'm really loving this little mighty might of a fountain pen, love it! You two are awesome by the way, and an amazing giveaway. Have a great Fountain Pen Day and weekend too! I am only using fountain pens all day. I am also making every one of my friends and family members write at least a sentence with a fountain pen. I am determinded to convert them all to fountain pen users today! I'll celebrate by taking fountain pen in hand and drawing beautiful pictures! Happy Fountain Pen Day!! Using my Metropolitan all day and my Plumix with Noodler's Golden Brown! I am going to ink up a few needy pens and pen a few letters!! toting around only fountain pens and wearing a fountain pen day button! I've been writing blog posts by hand with my pens! Happiest of Fountain Pen Days! I'm giving fountain pens to a few people to celebrate Fountain Pen Day. They don't even know it's a holiday yet! But they will soon. I'm going to celebrate by writing EVERYTHING with fountain pens....except maybe my Statistics test scantron. And then staring longingly at all the beautiful fountain pens online and wishing I could buy them instead of paying rent. I was happy to find a pen exactly like the one I started to write with 50 years ago. Good fountain pen day! I will show friends some of my prized pens, and try to write using fountain pens only! Wow. Some fabulous items you have there. 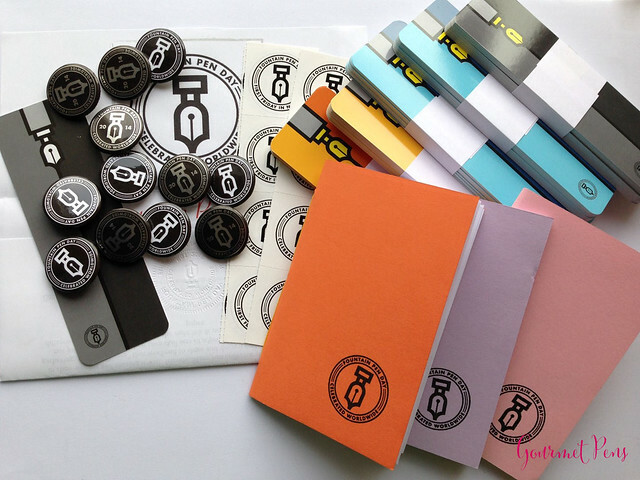 The fountain pen day swag looks pretty amazing. You guys are great for doing this and supporting Fountain Pen Day! So much wonderful stuff going on today. I made all my notes with my fountain pen today! Also, all the editing that I did on my technical report today were done with my fountain pen :) bought myself a new fountain pen online with 3 different colours of ink, and watched some videos from Stephen Brown. My first time celebrating fountain pen day and I loved it! Happy Fountain Pen Day!!! Cheers! Thanks so much for hosting such an awesome giveaway! Happy Fountain Pen Day!! I'm celebrating Fountain Pen Day by inking up my new Jade Neponset from Vanness Pens! And for extra fun this weekend there's a Franklin-Christoph Model 66 with Matsuyama nib arriving tomorrow.... oh joy! Going to the Fountain Pen Day pen meet of FPN-Philippines! Thanks for the chance to win! Thank you both for all you do for the community! Happy Fountain Pen day to you both! Hope you & Stephen had a good Fountain Pen Day! I'm celebrating by using fountain pens more. I don't write much in my day-to-day life, but I will be using fountain pens to write my notes for my classes! This is a great giveaway. Thank you so much for the chance to win. This is an exciting way to spread the love of fountain pens. I always wanted a Marlen pen, and that FA nib looks nice! Thanks for making this day an special day. Thanks for doing this giveaway... I think I need more swag! So very generous of you! Thank you and good luck to all who enter. Will be doing all my writing today with a FP. I'll celebrate by cleaning my collection of pens. I bought a pen for my sister and one for me. I celebrate it with my Lamy and TWSBi-Fountianpens with writing studying notes for the Exams in February and i search for a new FP. Love the blog and videos! Hope you both had a great Fountain Pen Day. Hope you had a great FP day - I even used a fountain pen at work - unheard of! WOW! WOW! WOW! This is awesome. Thank you for a great giveaway. What a great opportunity! Thank you! I love your ink displays. You must have a lot of fun with all those inks and nibs to play with. Your handwriting is sooo much neater than mine. I have been too busy with other things for most of this year and my fountain pens have languished in their holders. I will celebrate fountain pen day by breaking out all my pens and reacquainting myself with them. What a fab giveaway! Thanks guys! I did a whole bunch of homework with my fountain pens. It wasn't a great experience, but at least I was using my pens! Happy Fountain Pen Week to all! Cool stuff, thanks for the giveaway! I plan to celebrate by transcribing my e-journal entries onto paper. Thanks for all your lovely reviews. Wonderful giveaway! Hello Azizah, love your reviews, and well, everything else too! You're awesome. Thanks for so many changes to win the giveaway! I wrote a letter to my sister for fountain pen day! :) Thanks for the giveaway! I never knew of this blog until now. Happy (Late) Fountain Pen Day! I'm having problems leaving comments on your and Stephen's Nibbage videos. They're great. You probably know that I'm a fan from way back. Ok, way back as far as 2012 is way back. You asked for suggestions for more videos. Here's one, based on the one you did on the Safari (great pen by the way. Yes, I collect them. Not as many as you, but collect them, along with other Lamy pens. They are great, reasonably priced pens). I digress. My suggestion is Nibbage reviews on pens less that $150. With the economy the way it is, I think people would respond more to these than the higher priced pens. Thanks. Nice idea... I celebrate Fountain Pen Day by drawing my idea of a tattoo with a Monteverde Invincia Deluxe (B nib, Diamine Oxblood) and a Pelikan M200 (F nib, Montblanc Midnight Blue). I actually spent a fair amount of the day cleaning my pens. Inky dinky doo. Special ink maybe some Noodlers. That is amazing! :) I never knew that there was a permanent grey besides Noodlers. Neat package. Thanks for doing the giveaway. I continued to use my fountain pen throughout the day, and shared my passion with my co-workers. I use fountain pens every day, one way or another. Why do I use a fountain pen? For the expressive writing and because they are retro cool. I love the feel of nib on paper. And they make me feel smart. I have begun my Fountain Pen Day celebration by watching the delightful SBRE Brown fountain pen salute video! I am now entering to win all of the cool stuff that you are so kind to be giving away -- and, though I would love it for myself, I hope to win it all as a gift for my oh-so-sweet husband who got me hooked on fountain pens, and I will spend the remainder of the day writing notes and cards to friends with my several beloved fountain pens (color-coded ink color to pen color -- yeah, I'm a nerd). Happy Fountain Pen Day all! I celebrated by myself, with a bit of writing but mostly just doodling. I will celebrate Fountain Pen Day by unboxing my new Monteverde Artista Crystal and inking it up for the first time! Thank you for all you do for the fountain pen community and the opportunity to win. I really appreciate the giveaway! And good luck to everyone! I will be celebrating by testing the many ink samples that I just procured. How do I plan on celebrating such a day? Swoopy writing with a Franklin Christoph music nib, that's how! Happy Fountain Pen Day! I use fountain pens at school. It got me weird looks at first but now everyone is used to it. I love having inky fingers, do you? Sorry but this is a big fake. No REAL giveaway but only poor self-marketing. I will celebrate this fine day by practicing my cursive. I have a 160 page notebook and I plan to fill it with practice letters. Well I liked the pen since your Serious Nibbage video but wasn't sold on it. Having it as a prize though would be fantastic! Happy fountain pen day and thanks for the giveaway. Great giveaway! Happy Fountain Pen Day! This is a season of Great Rejoicing for all Fountain Pen connoisseurs from every tribe, tongue & nation of people. I devoted the day to calligraphy and made some motivational posters! Happy late fountain pen day!!! I have seen others with the FPD swag, where did they get it? Happy Fountain Pen Day! Such a cool give-away :-). Happy Fountain Pen Day!! Hope everyone enjoyed writing with al their pens on the 6th! I celebrated writing letters to friends and also bought a new pen to try. Thanks for the giveaway! Every day is Fountain Pen Day! Yeah! Wet and flexible fun for fountain pen day! Fountain Pen day every day! Just made myself an italic nib... Happy Fountain Pen day! Pleaseohpleaseohplease...let it come to me! Winner of the Fountain Pen Day 2014 Giveaway!